I wanted to be in our nation’s capital to stand against hate, to register my opposition to the “Unite the Right 2” rally on Sunday in Washington, D.C.
My intentions were peaceful. I was hoping that I could, in some small way, help to bring our country back from the hate, violence and death that occurred in Charlottesville one year ago. And yet, I was afraid that the white supremacists would, once again, bring devastating psychological and physical harm to people who are committed to unity, not division. Lecia Brooks speaks to media in D.C. on Sunday, August 12. As it turned out, the white supremacists didn’t succeed in spreading their hate. Although they had hoped to gather 400 people in Lafayette Park, across from the White House, they only managed to attract about 40. In contrast, thousands of protesters chanting “Go home, Nazis!” “No Trump! No KKK! No fascist USA!” and “Black Lives Matter!” effectively drowned out any message the white supremacists tried to offer, and no violence was reported during the rally. I didn’t attend the White House protest. 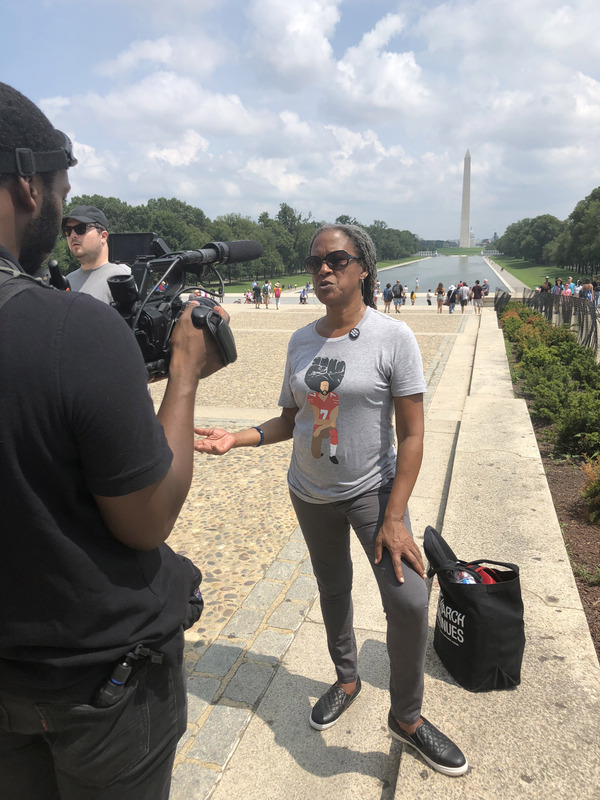 But I did participate in another rally against hate that began over a mile away at the King Memorial, and ended at the Lincoln Memorial, on the same steps where Martin Luther King Jr. made his famous “I Have a Dream” speech in 1963. My adventure in Washington, D.C., began on Friday afternoon, when I arrived at the Washington Hebrew Congregation for a “teach-in” hosted by U.S. Rep. Jamie Raskin of Maryland and U.S. Rep. Eleanor Holmes Norton of the District of Columbia. Right from the start, I was reminded that there are many more of us – the unifiers – than of them, the dividers. During the teach-in event, I shared the stage with proud social justice warriors from the American Civil Liberties Union, the Anti-Defamation League and the Oregon Coalition Against Hate, as well as the vice mayor of Charlottesville, and the board chair of Life After Hate, a nonprofit organization that helps people leave hate groups. After a brief primer on the white supremacist/white nationalist movement, the “teach-in” hosted a panel discussion titled, “Effective Community Responses to Racial Extremism and White Nationalism,” which ended with a question-and-answer session from the audience. On Sunday, we were scheduled to connect with Hawk Newsome, president of Black Lives Matter of Greater New York, to participate in the #AgapeMarch. Newsome and his group began their march in New York City on Saturday, ending with a rally at the King Memorial and then another rally at the Lincoln Memorial in Washington, D.C.
Newsome decided he was going to walk in love from the Bronx, New York, to Washington, D.C. Newsome and a small contingent of marchers first came to the King Memorial, praying and paying homage to the man who committed and gave his life to love and non-violence. It was there that I, along with a multiracial and multigenerational group of folks who had heard about the Agape March, joined in to make our way to the Lincoln Memorial. Newsome started us off, quite naturally, with the song, “We Shall Overcome.” We sang a few more standards from the civil rights era, including, “Ain’t Gonna Let Nobody Turn Me Around,” before making our way to the Lincoln Memorial, with more unifiers in tow. As expected, the Lincoln Memorial was packed with tourists. They appeared delighted as we marched up the steps and took center stage, in the very same spot where King, U.S. Rep. John Lewis, famed gospel singer Mahalia Jackson and others did at the original March on Washington in 1963. A young African-American woman from Iowa, who emceed the rally, introduced the speakers. They were young, old, Latino, Jewish, Middle Eastern, black and white. All spoke passionately about the power of love to conquer hate. When I took the stage, I felt humbled and so very grateful. I wanted to validate the feeling that hate has become more present and visible in our communities, so I shared what our research at the SPLC says about the increase in hate groups and hate crimes, including the fact that we’re currently tracking more than 1,600 extremist groups operating across the country. I made a commitment to the crowd that the SPLC would continue to track and call out hate wherever it shows up, including the White House. I spoke about how the Trump administration’s policies directly attack immigrants, Muslims and the LGBTQ community, and I strongly encouraged people in the crowd to stand up for one another and not let the hateful policies of the Trump administration divide us. I spoke about the need to stand up to hateful acts wherever and whenever we see them – in our families, at the workplace and in public spaces. “We cannot allow bigoted behavior to become normalized,” I said. In closing, I talked about the Civil Rights Memorial across the street from the SPLC’s headquarters in Montgomery, how it memorializes the 1963 March on Washington, and how it honors more than 40 martyrs – including King – who lost their lives to the struggle for civil rights. I encouraged those who were gathered with us in Washington, D.C., to feel the power of people who stood before us in this very space, and I invited them to help continue the march for freedom and justice. I was honored to witness that this weekend.